The healthcare environment is constantly changing in regards to patient care practices, technological advancements, and health professionals’ scopes of practice. There is now a larger focus on safety, quality improvement, patient-centered care, and health outcomes. In recent years, healthcare has also shifted towards wellness and preventative care rather than illness treatment with an emphasis on improving patient education and health literacy. As the first advanced practice registered nursing (APRN) profession, the Clinical Nurse Specialist (CNS) role has been evolving over several decades. New developments include the Adult-Gerontology CNS (AGCNS) certification1 along with an expanding scope of practice that allows for diagnosing, treating, and prescribing, all of which have the potential to address many healthcare disparities and practice issues. Over the next few years, several CNS certifications are being phased out,1 and with that, many universities are discontinuing their CNS programs. It is imperative that the remaining programs make curricular changes that are consistent with the current healthcare demands and certification expectations. 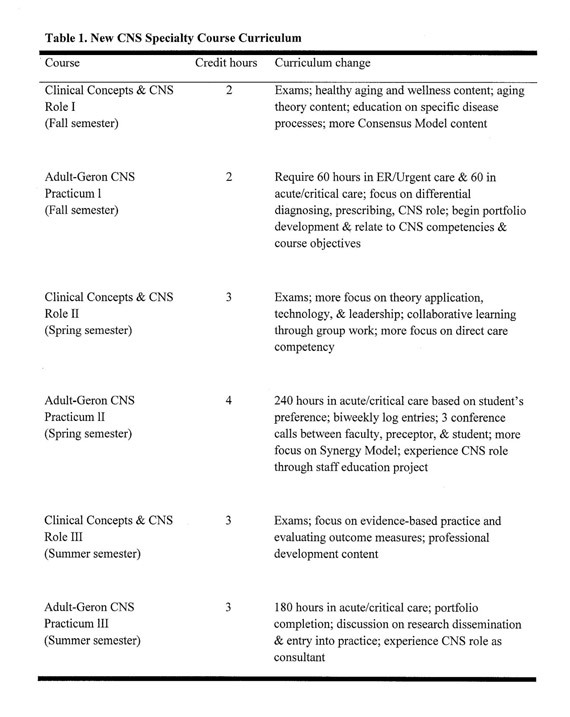 In order to reach these goals and sustain the CNS profession, strategies were developed to revamp an older curriculum model to the expectations and requirements consistent with the new certification. What Was Lacking in the Old Curriculum? The original AGCNS curriculum was established based on an older healthcare model that did not include many of the aforementioned newer healthcare changes. One major issue was the fact that students were only eligible for the Adult Health CNS certification through the American Nursing Credentialing Center (ANCC) without the option to obtain certification related to critical-care through the American Association of Critical-Care Nurses (AACN). 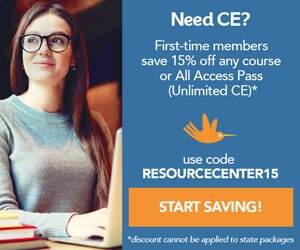 With the large percentage of APRNs who have a background in critical-care, it was imperative that students be eligible to sit for either AGCNS certification exam. Additionally, the old curriculum lacked substantial gerontology content. The main focus was on adult health with minimal gerontology-specific information. In addition, there were no specific requirements for students to engage with patients across the entire adult-gerontology age spectrum which begins with adolescence.2 Students were not expected to track the patients by age during the clinical experience, which left faculty unable to verify that students encountered patients of all ages from adolescent to older adulthood. In accordance with the idea of wellness and preventative care versus illness treatment, certifications now require CNS curricula to include the care of patients across the healthcare spectrum from wellness through acute illness,3 which was not previously addressed in the old curriculum. Collaboration is a cornerstone of CNS practice and needed a heavier influence within the curriculum. There were limited opportunities for students to work collectively as groups within the course assignments. Assignments also had minimal content related to collaboration and consultation in the workplace. Another limitation of the old curriculum was that students did not have course exams to help prepare them for the certification exams. The expectation is that all graduates will sit for a CNS certification exam. Previously all didactic course work only included papers and discussion forums. The certification exams’ content outlines specify requirements based on patient age and/or disease process,2,4 none of which were of focus in the old curriculum. How Was the New Curriculum Developed? Two new textbooks were adopted to cover content on healthy aging across the life span and advanced practice concepts in disease management & critical care. New ER/Urgent Care clinical experience was added as a requirement for introduction to diagnosing and prescribing. Clinical requirements were added to ensure patient care across the adult-gerontology age spectrum. Biweekly clinical logs were incorporated in addition to the CNS competencies log to track student clinical progress. Assignments were added to address wellness and prevention through group work and patient/staff education projects. Exams were added to all didactic courses to help students prepare for certification exams and test content knowledge. In order to accomplish all of the goals of the new CNS curriculum, an additional two credit hours were added to the degree requirements. The program was extended to six courses over three semesters rather than four courses over two semesters. With the 540 clinical hours required, a spread over three semesters is more manageable for working students. In an effort to sustain the CNS profession, an AGCNS program has been completely revamped with a focus on certification requirements, CNS competencies, the APRN Consensus Model, and current healthcare practices. Graduates of the CNS program are now eligible to take either or both Adult Gerontology CNS certifications through ANCC and AACN as the new curriculum has been approved by both certifying bodies. There has also been more positive feedback than previous years from preceptors about the students’ knowledge level and abilities in the clinical setting with multiple students receiving employment opportunities well before graduating. This curricular change now provides future APRNs with the skills and knowledge required to practice as expert clinicians and allows graduates to fill an important niche in the dynamic healthcare environment. 1. ANCC. ANCC certification center. http://www.nursecredentialing.org/certification.aspx. Published 2016. Accessed April 18, 2016. 2. ANCC. Adult-gerontology clinical nurse specialist board certification examination. http://nursecredentialing.org/AdultGeroCNS-TCO. Published November 10, 2012. Accessed April 18, 2016. 3. AACN. ACCNS-AG certification for adult-gerontology clinical nurse specialists. http://www.aacn.org/wd/certifications/content/accns-ag-landing.pcms? menu=certification. Published 2016. Accessed April 18, 2016. 4. AACN. ACCNS-AG exam handbook. http://www.aacn.org/wd/certifications/docs/accns-ag-exam-handbook.pdf. Published February 2016. Accessed April 18, 2016.
certificate educational programs. National Task Force on the Guidelines for Clinical Nurse Specialist Education. http://www.nacns.org/docs/CNSEducationCriteria.pdf. Published December 19, 2011. Accessed April 18, 2016. 6. NACNS. Statement on clinical nurse practice and education. http://www.nacns.org/docs/NACNS-Statement.pdf. Published 2004. Accessed April 18, 2016. MastersEssentials11.pdf. Published March 21, 2011. Accessed April 18, 2016. Chondra Butler is assistant professor at the University of South Alabama in the Adult Health Nursing Department. She is the track coordinator of both the Masters and Doctoral Adult-Gerontology Clinical Nurse Specialist Programs.